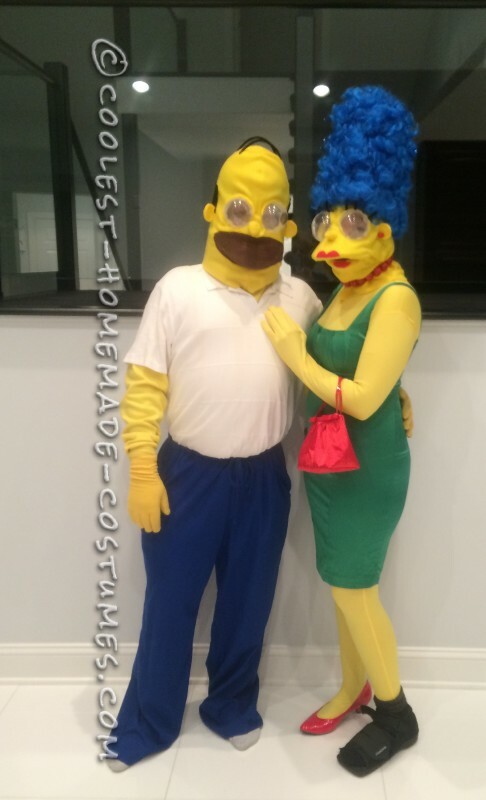 We wanted to celebrate the Simpsons 25 year anniversary and since my family loves them so much, making Marge and Homer Simpson costumes would be fun. The biggest issue was that you could buy the men’s Homer in latex along with other characters, but not of any of the girls. Not a problem for me since I have allergies to it even if they did. So, I decided to start them both from scratch. 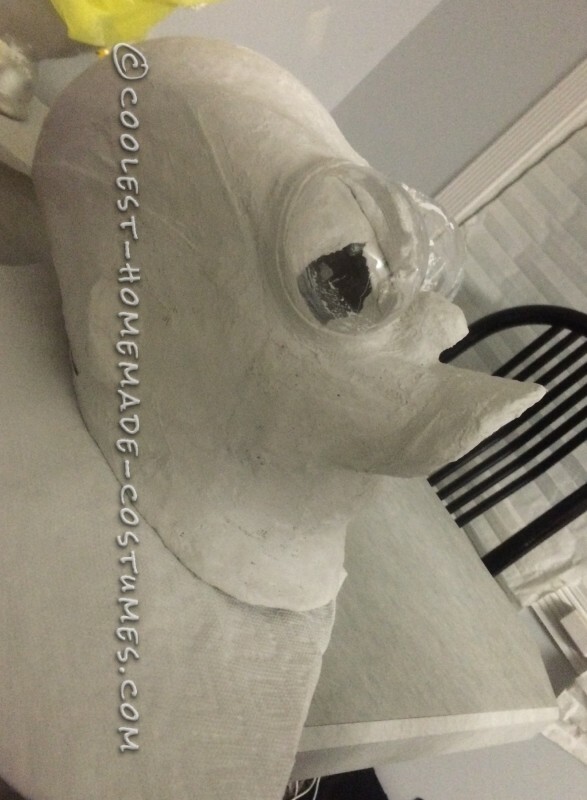 I made plaster cloth forms to the head sizing we needed using just a basic face mask to add room for nose and eye placement. 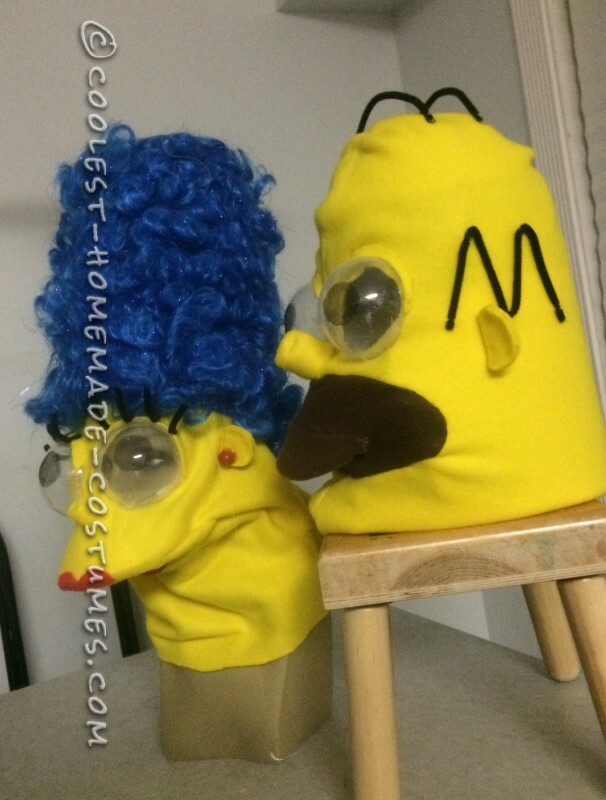 After finishing the forms, I used thick flannel in yellow and draped marge and cut out the eyes 1/2 inch smaller than the eyes. I used the sewing machine to sew up after pinning. 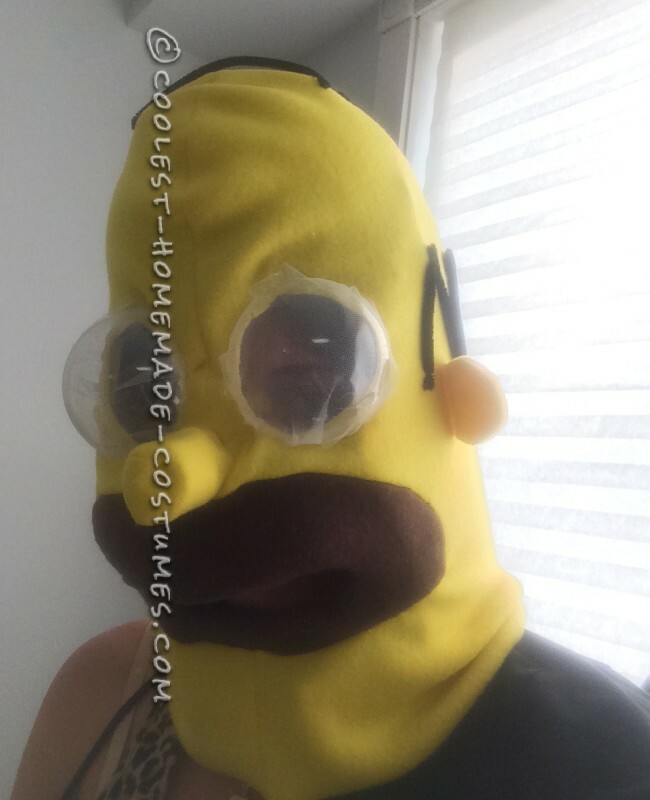 I used 1/2 inch thick craft foam and cut into banana shapes, one large and one small. I cut the mouth about three inches long open from one inch up from bottom lip. The small piece of foam was hot glue gunned in and folded over into mouth to smooth edges leaving curved side going in the chin. This was important, when I did it, it was a fluke that made the entire mask fit on my face with no support anywhere else. Top lip with large foam and I used another piece of foam and hot glued it on the inside curving downward. The top and bottom were joined on corners of each side together and glued. After I glued the fabric to the upper lip and sides of the foam. The eyes were plastic and had I done what I thought was best, my husband would have been more comfortable. It’s a good idea to drill holes in the plastic to let out steam. I didn’t have any issues but my husband fogged up really bad. I used white mesh as the base and glued on at the rim. The black mesh for the pupils was glued on with a tacky glue very lightly used so it wouldn’t affect vision. The eyes were glued on to the fabric leaving a 1/4 inch inside. The nose was the fabric cut out from the eyes cut in half and sewn up. 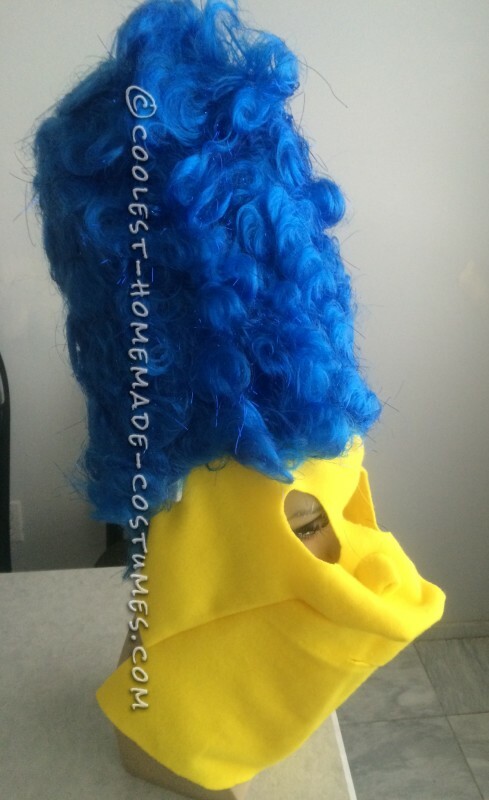 Marge’s hair was bought from spirit halloween store online. I put it on a dummy head where it would fit me and used the thick craft foam, taped it together creating a cylinder to keep the hair standing up. I sewed the hair on by hand. Once it was finished, I took in a little extra fabric from the sides and anything that looked loose in the face was glued inward creating a seam. 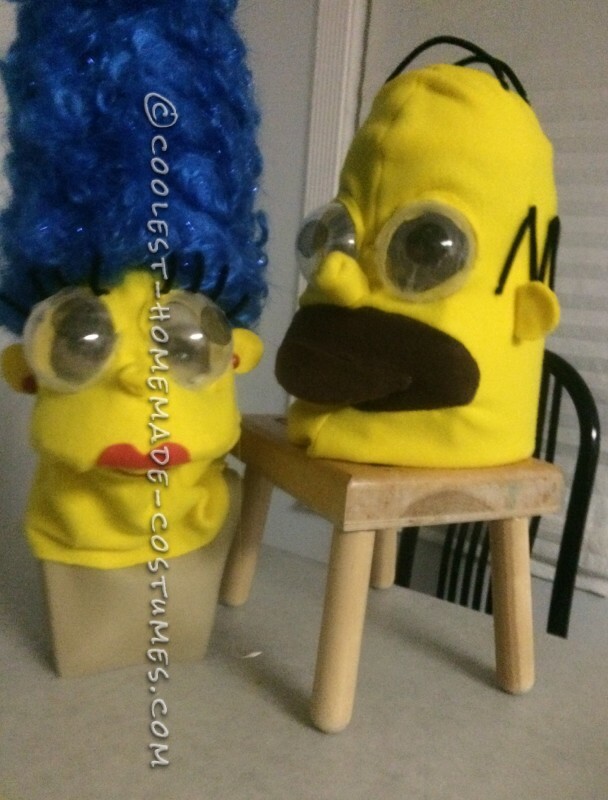 With homer I cut the fabric in half, sort of U-shaped. I cut the eye holes and then the mouth out. I took the brown flannel and cut the same as the cut out and sewed the brown in. 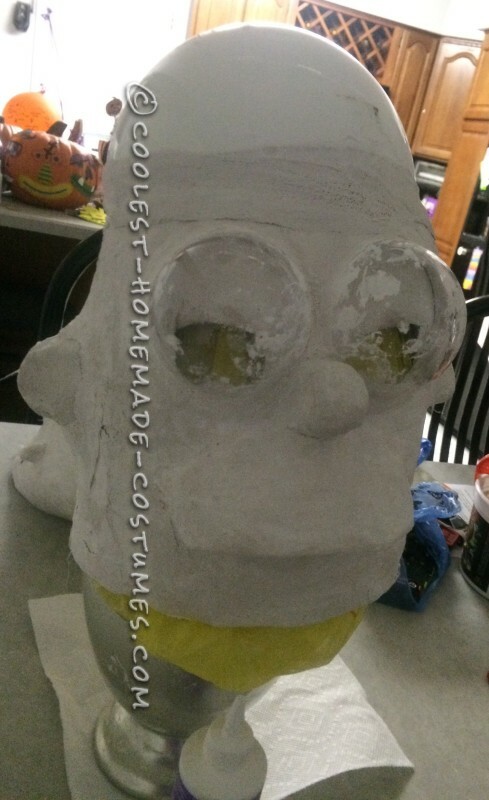 I used the foam around the head leaving the front of the face with none to even out the weight. It isn’t heavy but it was important to have it even so it doesn’t fall back or forward. To keep the top of the head round I had used an 8 inch half circle plastic light cover that I had lying around. I taped a soft foam 1 1/2 inch thick to the bottom for head comfort and breathability. The homer pants were blue scrubs and the dress I had along with the red shoes and bag. I did have to buy a yellow suit as I couldn’t find yellow tights for the life of me. I had the yellow gloves also. Overall a fun project and I could have done without the plaster forms that I started with.